Some days all I want to do is be completely lazy. And let me tell you, laziness has its privileges. Spending the entire day in my pajamas, sleeping in, and selfishly setting aside my normal routine in order to experience the type of instant gratification becoming of a six year old child. Yep, that was me the other day, except without the tantrum but complete with dancing to Beyonce’s Crazy in Love (booty shake included) while kicking my daughters’ butts in Wii’s Just Dance 2. I held no prisoners and proved once and for all, I still got game. No…. not really. I can’t dance. But the three of us had a lot of fun with my oldest daughter commenting how surprised she was with my moves. I’m still trying to figure out if she meant that as a compliment or as an insult. Either way, for one moment in time, I was a kid again. My girls have no school this week and after our little dancefest we decided to make cookies. But my lazy self did not want to bake for some unexplainable reason. Instead, I looked in our cupboards to see what we had on hand to make something which required little work. Seeing that lonely box of unopened Corn Flakes was just the inspiration I needed to satisfy my sweet tooth and affirm my laziness with very little clean up. I’m all about simple recipes which are ridiculously easy to prepare and are oh-so-good. 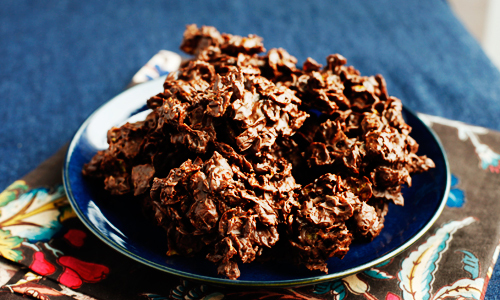 My kids and I made these chocolate peanut butter haystacks except I made them with Corn Flakes instead of the typical dried chow-mein noodles. 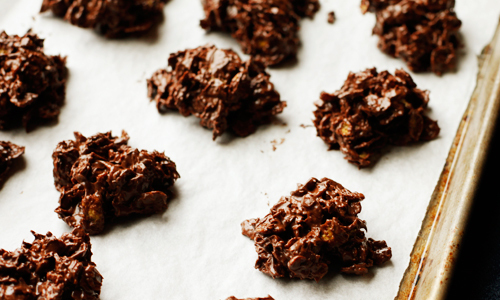 I heart no-bake treats, especially when they’re only 3 ingredients and include chocolate. In my opinion they are a borderline no-bake cookie or possibly a crunchy chocolate candy bar. Who cares,they are super crazy good! Enjoy! 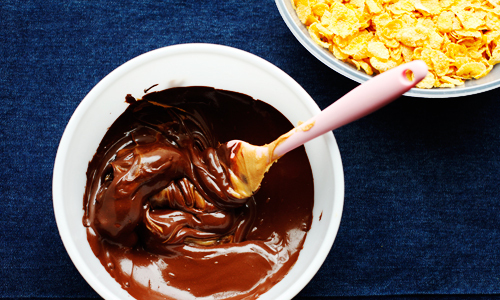 Place chocolate chips in a microwave-safe bowl. Microwave for 30 seconds and stir. Repeat this until the chocolate chips are smooth. Add peanut butter and stir until well combined. 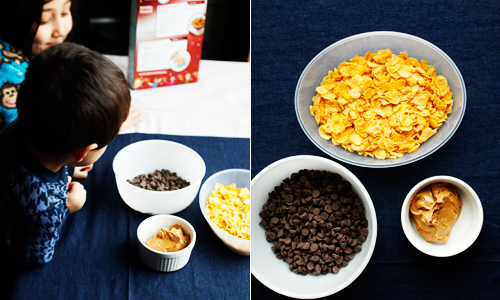 Fold in Corn Flakes until the flakes are evenly coated. Drop the mix by the tablespoons on a parchment paper lined baking sheet. Allow mounds to cool and harden in the refrigerator for 30 minutes. Or if you're experiencing snow (like we are in Seattle) and your refrigerator is packed (like mine), stick them in your car. Can we use chocolate syrup instead of melting chocolate chips. I have a cooking widout fire competition. Just a note to say that sometimes you have to rearrange your whole fridge to make cookie sheets fit, when you’re cooling chocolate stuff. Find two matching taller things about the same height, one on each side, and balance your cookie sheets on top. Three nearly the same height is even better. We have a side by side fridge, & not a lot of room, so everything is stacked up when it’s full, which is all the time! We were making chocolate candy for a party, 3 cookie sheets worth. All you need is 1.5 inches of space at the very top of each shelf. After my husband cleaned out the fridge and reorganized it, I opened the door and burst out laughing. Everything was so neat, tidy, and spacious….until I saw the top shelf. Stacks on top of stacks – Couldn’t squeeze a toothpick in there. Amazing it didn’t all fall out… It reminded me of those stone houses they built in Medieval times without using any mortar…Everything fit together perfectly so the house didn’t cave! I used fresh ground up NON GMO/ Organic cornflakes, almonds (& a dash of homemade almond extract ) & or macadamia’s. Someone is allegic to peanut butter here. who doesn’t love peanut butter and chocolate, these sound soooooooo good!!! I will be making these real soon. Thanks so much for your post, it was exactly what I needed. I was searching at least three recipe sites and they didn’t have the no-bake haystack with PB and chocolate like I wanted/needed today. Simple is the way to go, thanks again! It’s 1/2 cup. Sorry.. I’ve been moving the recipes over to a new format and it looks like some of the ingredients in the list cut chopped off. The recipe printed above says “cup”. Does that mean 1 cup? Love this! My grandmother made these with either Cheerios or All Bran when I was growing up (I preferred cheerios). Brings back so many memories. 🙂 I’ll have to try making them myself now. I make these all the time, only I use 1 bag of butterscotch chips with 1 cup creamy peanut butter and 4-5 cups of the corn flakes, and they are soo addicting! Found your blog link from etsy, the scones look amazing! I would love to make these! I think i’m going to do it for a friends bday party. Thanks! Oh my goodness, Yum! I love simple recipes that are so delicious! Just found your site, its amazing! About how many cookies did one batch make? They look wonderful! Carini, you could but you wouldn’t have any crunch to it unless you used granola. 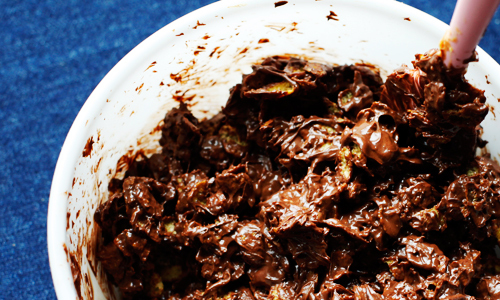 No, nutella will not work instead of chocolate chips. It’s too soft and will not harden to handle each piece. However, you can sub nutella for the peanut butter. Would nutella instead if choc chips work? 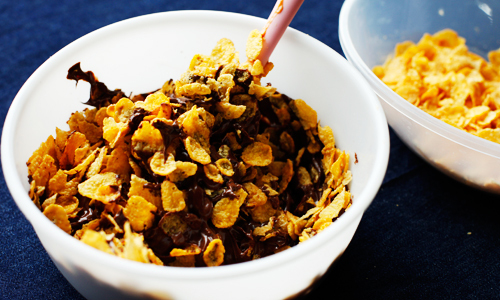 I wonder if you could do this with oatmeal instead of the cornflakes? Glad to see you back here posting! I will try this with my fiesty 3 year old girl this weekend…or maybe tonight (instant chocolate craving commenced as I was typing)! .find, useful, topics and issues,greek,mediterranean, history, recipes, food, herbs, etc. Bring 1 cup sugar & 1 cup corn syrup to a boil for one minute. Remove from heat and stir in 1 cup peanut butter. Stir in 6 cups cornflakes. Drop spoonfuls onto waxed paper. My mom used to make these for me when I forgot to tell her about a class party/bake sale/etc until the night before. Sometimes easy is the way to go!